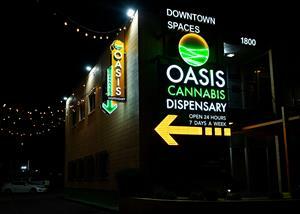 LAS VEGAS, NV, April 01, 2019 (GLOBE NEWSWIRE) -- via NEWMEDIAWIRE -- The Oasis Cannabis dispensary in Las Vegas, Nevada, and the City Trees brand, both of which are fully owned and operated by CLS Holdings USA, Inc. (OTCQB: CLSH) (CSE: CLSH.U), have set a new record for the most revenue in a single month, with total combined net revenue in Nevada exceeding USD $1 Million in March, 2019. Founded in 2017, City Trees is a Nevada based cannabis cultivation, production and distribution company. Offering a wide variety of products with consistent results, City Trees is one the fastest growing wholesale companies in the industry. Its products are now available at 40 dispensaries in Nevada. CLS Holdings USA, Inc. (OTCQB: CLSH) (CSE: CLSH.U) is a diversified cannabis company that acts as an integrated cannabis producer and retailer through its Oasis Cannabis subsidiaries in Nevada, and plans to expand to other states.